Respite care provides caregivers a temporary rest from caring for a loved one. It also allows caregivers time to take care of errands while having comfort and peace of mind, knowing their loved one is safe. The DARC Respite Care Fund provides grants for respite care for caregivers in St. Clair County. Residents of St. Clair County who are the primary caregiver of an individual that has been diagnosed with a form of dementia by a physician. Please note; this grant is only available to applicants who are not currently receiving charity respite care through other St. Clair County agencies. There are no income requirements for program eligibility. Local healthcare agencies will provide the care for your loved one in your home or at an adult day care center. 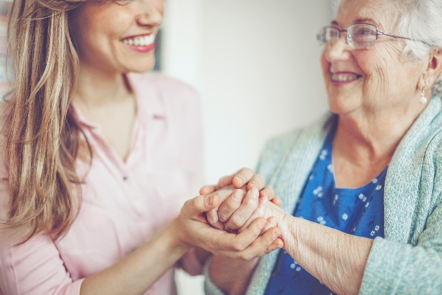 Our partnering healthcare agencies provide staff educated in dementia care that are committed to providing quality respite care. All staff have passed a thorough background check. At the beginning of each year, the DARC Board will set aside funds to be used for respite care grants. Grants will be available on a first come, first served basis and are paid directly to the agency providing care. The agency will work with you to deliver services based on your request, need, and aide availability. DARC is not responsible for any fees accrued beyond the amount awarded with the grant. Caregivers must start using funds within 3 months of application approval. Note: Applications are reviewed on a bi-monthly basis by Resource Committee members. After your application has been reviewed we will contact you and your preferred care provider. All applications will remain on file for one year. *If you require immediate or extended respite care, please contact your physician or local home health agency. Many home health agencies have charity care respite dollars readily available. Complete the application form and include confirmation of dementia diagnosis from attending physician and mail to: D.A.R.C. Fred Haynes Respite Care Fund, 600 Grand River Ave, Port Huron, MI 48060. You can also call 810-990-9558 for more information. Adult day care services provide a safe and nurturing environment for someone with dementia or Alzheimer’s disease one or more days a week. We are fortunate to have two not-for-profit Adult Day programs in Port Huron. Both centers provide stimulation for the person with dementia or Alzheimer’s disease, while allowing the caregiver a break.